This is a short list of “What’s this for?” and “How do I used this?”. By no means is this an all inclusive list of first aid products. Protecting a shallow laceration of the fingertip or thumb tip. Covering a cut or abrasion between the fingers or toes. Protecting a loose fingernail or toenail (partial nail avulsion). Covering a small chin or nose abrasion. Protecting a shallow laceration on a knuckle. Covering an abrasion on a “curve” like the heel or chin. Covering an abrasion or cut on the back of the elbow. Covering any area where the skin stretches or moves. An open wound (such as an abrasion) on the thigh. A scrape on the shoulder. A small burn on the trunk or thigh. A bandage of this type does NOT provide adequate protection for a large laceration, because it doesn’t provide any compression or traction to keep the cut closed. A small shallow puncture wound that is not bleeding. A partial thickness laceration on a finger (not over the knuckle). A tiny abrasion on a non-moving area. Plastic strips are NOT appropriate for wounds where the skin stretches with motion — for example on the back of the elbow or underside of the wrist. They’re NOT to be used on lacerations that require intervention to close. Cloth bandages are more flexible over moving parts. But they tend to fray and unroll from the wound. The adhesive on a cloth bandage is more likely to leave a residue. So for most cuts, a plastic bandage is a better choice. But where the cloth bandage works, it’s wonderful. A butterfly bandage is used to pull the edges of a short laceration together. Typically, a butterfly is used for a small cut that tends to gape a bit. The edges of the cut must be sharp, not rough or irregular. Because the butterfly dressing does NOT stretch, it can only be used where the skin will not stretch or shift while the wound heals. In general, steri-strip closure is preferred to butterfly bandages. To place the butterfly, the laceration edges are pushed together. The strip is placed across the wound (long direction of the strip aiming 90 degrees opposite the long direction of the cut). One side is pressed firmly into place, with the narrow waist lying directly over the cut. Then the second “paddle” is pushed onto the skin. The butterfly is left in place while the cut heals. It’s usually best to protect the butterfly by covering it with a gauze pad and a kling wrap. Steri-Strips (TM 3M) are wound closure tapes. They are ideal for partial thickness cuts. Steris are more flexible than a butterfly bandage, and can close longer lacerations. After cleaning the laceration, dry the surrounding skin. Apply benzoin tincture to the skin (don’t get it in the cut). Cut the strips, and then push the laceration edges together. Place strips across the wound (long direction of the strip aiming 90 degrees opposite the long direction of the cut). Protect with gauze (without antibiotic ointment) and a wrap. The steri-strips can be left in place while the wound heals. Steri-Strips may not provide good long-term protection in areas where the skin shifts or stretches (underside of the wrist, back of the elbow). 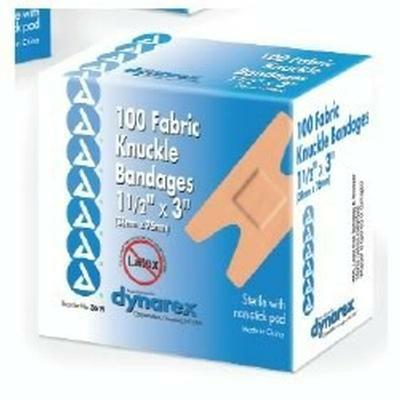 The only disadvantage is: they’re not as easy to find as butterfly bandages, and they’re more expensive. Non-adherent pads are useful to cover open wounds such as burns and abrasions. The pad keeps the dressing from sticking to the wound. After cleaning the wound, antibiotic ointment is applied. Be sure the patient isn’t allergic to the antibiotic. The non-stick pad is placed next, then a gauze pad to cushion and protect. A kling wrap keeps the gauze in place. Gauze pads cushion and protect wounds. They also prevent dryness in an open wound. The gauze pads have a loose weave, so blood and fluids can ooze pass through to be absorbed. To construct a dressing, first place a non-stick pad. Put the gauze directly over top. Bind it down with a roller gauze (kling wrap). If you need compression (either to prevent swelling or bleeding, or to keep the bandage in place), add an elastic wrap or Coban wrap. Otherwise, apply just enough tape to keep the dressing in place. Padding roll gauze is very useful to cushion large wounds. It’s often called “Kerlix,” which is a specific brand. It can be used in place of a kling wrap in the dressing, and for many wounds provides enough padding that gauze pads are not required. It absorbs ooze or blood, and prevents dryness in an open wound. The padding roll gauze can also be used for compression dressings, for example to compress a sprained ankle. Apply it under the elastic wrap. While a lady may carry a napkin or pantyliner for “emergencies” on the trail, there are other uses. The pad is sterile, absorbent, doesn’t gum up and stick to the wound like toilet paper, and removes in one piece. The pad makes an excellent temporary dressing. It can also be used as padding over an injury. It’s large enough to give a sterile covering for a big wound or open fractures. The multi-trauma dressing can be used as padding, or as coverage. Coming in various sizes, these dressings unfold to cover the entire chest or abdomen. The large size makes it useful for covering large areas of burn or abrasion while you travel to a medical facility. It can be used to cover exposed viscera. The dressing can be used to pad an injured arm or leg inside a splint. Eye pads are padded dressings for the eye. Eye pads are used to keep the eye shut following minor eye injuries such as a corneal abrasion. Depending on the depth of the eye socket, you may have to fold a pad in half to get the right amount of pressure. The eye pad is taped in place. Run the bands of tape in an oblique direction: aim the top end for the middle of the front hairline and the bottom end for the angle of the jaw. NOTE: You should NOT tape an eye pad over an eye that may have been punctured, or that has an impaled object. Instead, tape a paper drinking cup (with the open end facing the eye) over the eye. Eye pads can also be used to provide local pressure over a wound. For example, to get control of bleeding in a puncture wound: place a couple of eye pads directly over it, secure it with a kling wrap, then use a compression wrap to apply pressure. Roller gauze is used to secure dressings. 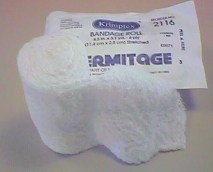 This type of bandage is called a kling wrap. Pick a size appropriate to the wound, and to the body part you’ll be bandaging. For example, a 1 inch roll is appropriate for fingers, while a 3 inch roll is about right for the upper arm. To construct a dressing, first place a non-stick pad. Put the gauze pad directly over top. Bind it down with your roller gauze. If you need compression (either to prevent swelling or bleeding, or to keep the bandage in place), add an elastic wrap or Coban wrap. Otherwise, apply just enough tape to keep the dressing in place. Padding roll gauze is very useful to cushion large wounds. It’s often called “Kerlix,” which is a specific brand. It can be used in place of a kling wrap in the dressing. It absorbs ooze or blood, and prevents dryness in an open wound. To construct a dressing, first place antibiotic ointment, then a non-stick pad. Put a gauze pad directly over top. Bind it down with the padding roll gauze. If you need compression (either to prevent swelling or bleeding, or to keep the bandage in place), add an elastic wrap or Coban wrap. Otherwise, apply just enough tape to keep the dressing in place. Compression of a healing shin muscle strain during sports. Support for a healing wrist sprain at work. Placement over a kling wrap to compress an injury. Coban does not rip. Use your scissors to cut it to the right length. In general, the wrap should be tightest at the end that’s furthest from the heart. Watch for signs that the wrap is too tight — such as swelling, numbness, discoloration, or pain “downstream” from the wrap. Coban contains latex, to which some people are allergic. Compression of injuries such as a sprain or bruise. Elastic immobilization or support of injured parts. Securing the dressing on a large open wound. Control of bleeding in wounds or fractures. Symptom control in rib fracture. Select a size appropriate to the injured part: adult wrist = 2 inch, adult ankle = 4 inch, adult thigh or chest = 6 inch. In general, the wrap should be tightest at the end that’s furthest away from your heart. Be careful that the wrap doesn’t cut off circulation — watch for swelling, discoloration, increasing pain, or numbness “downstream” from the wrap. Tape can be used to secure a dressing, but it’s not the ideal choice. (A kling wrap secured with self-adhering wrap such as Coban is ideal. But tape may be useful when pressure is needed on a finger wound, or when you need a little extra security to keep a dressing from unraveling. “sticky pickup” of glass fragments from the skin. Taping a joint for stability. Immobilizing a laceration over a finger joint. The splint can be cut to length with your EMT snips. Bend it to the position desired; the finger is usually most comfortable in a “half-bent” position. The splint is secured with bands of tape. The triangular bandage’s primary use is as a sling. But it can be surprisingly handy. The triangular bandage can also be used as a tie for a splint on the arm or leg. It can be used as a wrap to secure a dressing. Unfold the cloth. Bring the long ends together around the neck, with the pointy end at the elbow. Secure it with a knot or pen. Keep the elbow from sliding out by typing a knot, pinning the flap, or tucking the extra cloth in.